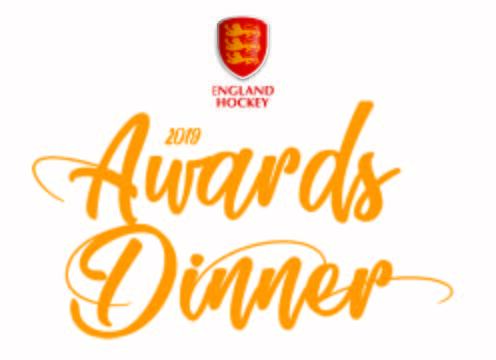 It is with great pride that we announce that our ladies 1s have been shortlisted for the Team of the Year Women Award at the 2019 England Hockey Awards Dinner on Saturday 11th May 2019. Although the ladies 1s have been nominated this couldn’t have happened without the support of all the clubs members, volunteers and officials who work to support the running of the club. The ladies 1s have been promoted this season and will play in Cheshire Division 2 in 19/20 season. This has largely resulted from the strength and depth that the club now has from the Academy through to the Men’s and Ladies senior sections. The ladies 1s are made up of a combination of players who have played for the club, come through the Academy and those who have joined the club based on its growing reputation. Players from the team are representing both County and Regional teams as well as school sides in the surrounding area. The team have been supported by a number of players coming through the ladies 2s and 3s which will give the club strength over the coming years. I hope you will all join us in celebrating this success and wish the ladies all the best on their big evening. The final game of the season for the ladies 1s was played away against Chester 3s. Whitchurch ladies were fired up to finish with a win and they certainly showed they deserved a place in division 2. From the push back Whitchurch kept possession moving the ball around the Chester players. Within minutes of the game Hebe Dixon shot the ball into the net for their first. All Chester could do was to hold back in defence as Whitchurch kept attacking. Lots of pressure from forwards Stephanie Stanton and Izzy Huxley allowed Dixon in the dee again to score their second. Chester broke a couple of times but were quickly picked up by defenders Millie Edwards and Emma Harper moving the ball out wide to Sophie Ward and Helena Dannenfeldt. More shots on goal for Whitchurch and Ellie Windsor managed to slip one passed the keeper, quickly followed by a deflection from Jessica Carruthers. Whitchurch had a run of short corners which allowed Dixon to strike another into the Chester goal. Captain Catherine Winter-Gresty and Lisa Sullivan protected the middle of the pitch and kept forcing the ball wide, Whitchurch kept moving the ball accurately around Chester and a fast moving ball was collected by Helena Dannenfeldt and slotted into the corner. Dixon scored their sixth goal from a strike from top dee just before half time. 6-0 up and Whitchurch spirits were very high. Keen to get back to the game Whitchurch set up quickly raring to go. Chester had a change round of players and seemed a little stronger, quickly winning a short corner and scoring from it. This didn’t put Whitchurch off as they came back with some fantastic movement up the pitch and Lisa Sullivan saw a gap from top dee and scored the seventh. Jessica Carruthers deflected the eighth from a shot in from Windsor. Whitchurch keeper Maddy Sugden had a quiet game only touching the ball twice clearing the ball out to Millie Edwards. Chester dropped more players in to defend but Whitchurch just had time for another goal from Hebe Dixon before the whistle went. A fantastic game to finish on for the ladies 1s and a promotion into division 2. 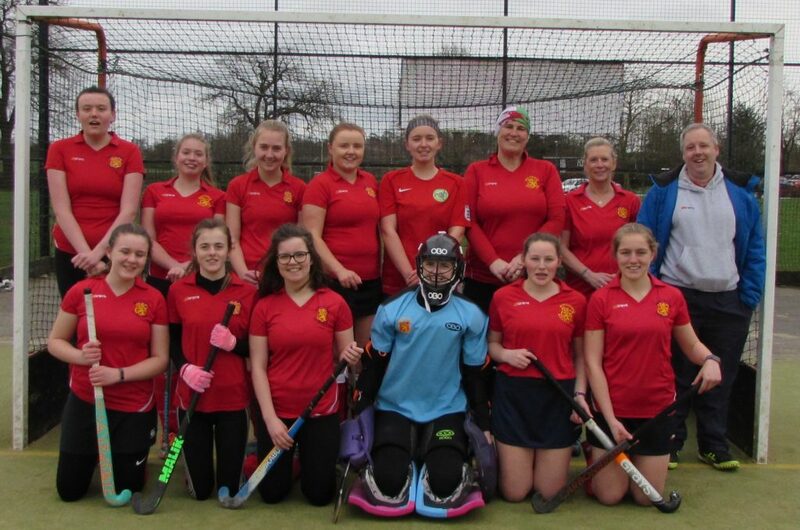 Whitchurch started their final match of the season with a strong attack led by centre forward Annie Buckeridge and supported by Mia Spruce and Kate Buckeridge. This attack continued and after some excellent passes from Laura Workman on the left wing found its way into the dee where Whitchurch had a shot on goal which was deflected and Holly Gilbert made an excellent aerial shot off the rebounding ball resulting in the first goal of the game for Whitchurch. Neston then applied some pressure to Whitchurch and after battling through Emily Lister in mid field, Jan Teggin in defence and goalie Louise Cottrell managed to equalise the score line so by half time the teams were equal. After a half time talk Whitchurch returned to the pitch hungry for more success. The attack of Milly Carruthers and Laura workman resulted in Whitchurch being awarded a short corner. Gayle Ladd received the ball but Neston were quick to defend the penalty corner but after a strong attack in the dee Wendy Cooper placed a shot into goal which was finished off by Ladd putting Whitchurch 2-1 ahead. Neston continued to attack but Whitchurch’s Annie Leigh and Beth Wright made some excellent challenges to win the ball, and Mel Reid made some excellent clearances from the back to send the ball to the Whitchurch attackers. Whitchurch ladies 3’s would like to thank all the coaches and supporters who have been with them this season. Whitchurch’s last away game of the season was at Oxton in some blustery conditions against a team of youthful but skilful players, and the match was fairly evenly balanced. Oxton’s team may have been young, but gave every impression of having trained together for years as they drove up the pitch in formation time and again, with confident and accurate passes and excellent movement off the ball. Whitchurch in turn mostly kept to their tasks of marking and closing down attacks, but just lacked at times the composure on the ball with first touches and passes often making things harder for themselves. There were some good passages of play, but too many of the balls forward didn’t quite make their targets, or clearances from the back just went to an opposition stick, so it was not unexpected when the pressure told and Oxton drove into the dee and fired a ball at goal which went through James Partington’s legs completely unsighting goalkeeper Paul “Sturge” Leigh. Shortly afterwards another drive forward by Oxton ended with a speculative ball across the dee to no-one unfortunately clipping Airan Jones’ foot past Sturge into the goal. The half time break gave the Reds a chance to regroup, but ultimately it was a case of doing what they already knew they needed to: tighten the marking, improve the passing and movement and keep composed on the ball. The second half started much brighter for Whitchurch with them taking the momentum in the match and having a lot of possession, especially in the Oxton end of the pitch. A number of shots were unlucky not to go in, or were saved by the excellent Oxton keeper, and when Oxton did break, the marking at the back was better from the Reds. Sturge was called on a number of times but, like last week, was able to keep out one-on-one attacks with strong blocks and good clearances. Danny Foulkes again provided composure and strength at the back, and Jones and Fred Egerton were strong out wide in defence as well as driving the ball out from the back. Alex Fry, Marcus Conway and Jack Barnes took control of the centre of the pitch, and Sam Conway, Craig Hockenhull, Ben Kimberley, Tom Forster and Nick Cooper rotated well at the front, getting behind the Oxton defence and causing them trouble. Eventually the pressure won Whitchurch a short corner and the routine went well, with Foulkes injecting and then receiving the switch back again to slot the ball through the defence to get Whitchurch on the scoreboard. The second half of the second half was much tougher for Whitchurch as the superior fitness and precision of the Oxton team showed, with attack after attack coming down the wings with runners on the overlap. Oxton won a number of short corners in the second half, and Partington made two baseball-like clearances from flicks as the defence rallied and Sturge made critical blocks, but the momentum had shifted back and it is to Whitchurch’s credit that they worked together well enough to prevent any more goals. Sadly, despite some excellent work by the midfield and forwards to make some scoring chances in the final few minutes, the ball stayed out and the game ended 2-1. Whitchurch’s final game of the season is at home next week against Northop Hall 2s. For their final home game of the season Whitchurch welcomed Denbigh 2s to a damp and blustery SJT. Earlier in the season Denbigh had shaded a close game by three goals to two, but the Welsh side were only able to bring nine players to Shropshire, so hopes were high that the Reds could get a positive result from this fixture. With their numerical superiority, Whitchurch dominated possession in the early stages. David Brunyard was providing the energy and Joe Coburn the guile in the centre of the pitch, whilst Joe Faithfull, Ethan Gresty, Owen Pearce and Jacob Buckeridge were creating width down the flanks as they subbed on and off. Good interplay led to some promising positions around the dee and the Reds won a couple of short corners that Denbigh survived with some last-ditch defending. The Reds did open the scoring early in the half when, after some neat Whitchurch play, Joe Coburn flicked the ball from the edge of the dee into the far corner of the goal. Despite continuing to dominate possession and territory, Whitchurch needed to be wary of quick counterattacks by the Welsh side. The Reds defence of Doug Buckeridge, Mark Sugden, Wyn Morris, Brendan Coburn and Will Snaith were dealing with most of the attacks and Denbigh struggled to get clear shooting chances. They did force a couple short corners but these were well dealt with by Whitchurch. Midway through the half the home side were caught out as the pacy Denbigh winger managed to sneak behind the defenders and receive the ball on his own in the dee. Keeper Glyn Teggin came out but was unable to prevent the Welsh side from levelling the scores. Whitchurch pushed forward to make amends for their mistake, but despite Richard Leigh’s calming presence in midfield, the Reds were struggling to string passes together near the Welsh dee. When they did get possession in the dee, shots were rushed and the visiting keeper was well protected by his defenders. Eventually the home side did find their composure and a good move down the right, involving Joe Coburn and Ethan Gresty, saw Luke Beddow sweep the ball home to restore the Whitchurch lead. The home side continued to dominate territory and possession in the second half and created a good opportunity from the push back by carefully passing the ball through the Denbigh team, making the most of their numerical advantage. Throughout the half, Whitchurch created chances in the opposition dee. Sometimes a lack of composure led to rushed and uncontrolled shots and on other occasions there was a surprising reticence to shoot when well placed. The Denbigh defence and keeper worked really hard to limit the Reds chances, with the keeper making two or three really good saves and Welsh bodies being put on the line, literally and metaphorically, to keep the ball out of their goal. Whitchurch won a number of short corners during the second half and at the umpteenth attempt, Euan Morris and Joe Coburn played a clever one-two in the dee and Euan fired home to make it 3-1 to the home side. Euan was unlucky not to add to his tally as the whistle went for a short corner just as he put the ball into the Denbigh net. Alex Leigh was denied from close range by various Welsh body parts and the home side were unable to find a finishing touch to a couple of goal mouth scrambles. Despite their tiring legs, Denbigh tried to create their own chances. Their speedy captain was always a threat on the counterattack and whilst the threat to the Whitchurch goal was sporadic, the defenders needed to be on their toes and Glyn Teggin needed to make a couple of good clearances. Whitchurch were good value for the 3-1 score line, but, churlishly, this was probably their least impressive performance of the past couple of months. Massive credit should go to the 9-men of Denbigh who defended doggedly and really made the home side work for the victory. Whitchurch had very few clear cut chances due to a combination of tight Welsh defending and poor decision making in the dee. Once again Joe Coburn was a standout performer, but Luke Beddow and Euan Morris played really well upfront and were a constant nuisance to the Denbigh defenders. Will Snaith had a great game in defence but offered good support to the attackers on the right hand side and Richard Leigh offered a calming presence in midfield when Whitchurch were getting a bit ragged and exasperated during the second half. The Reds play their final game of the season away to Northrop Hall 3s next weekend. 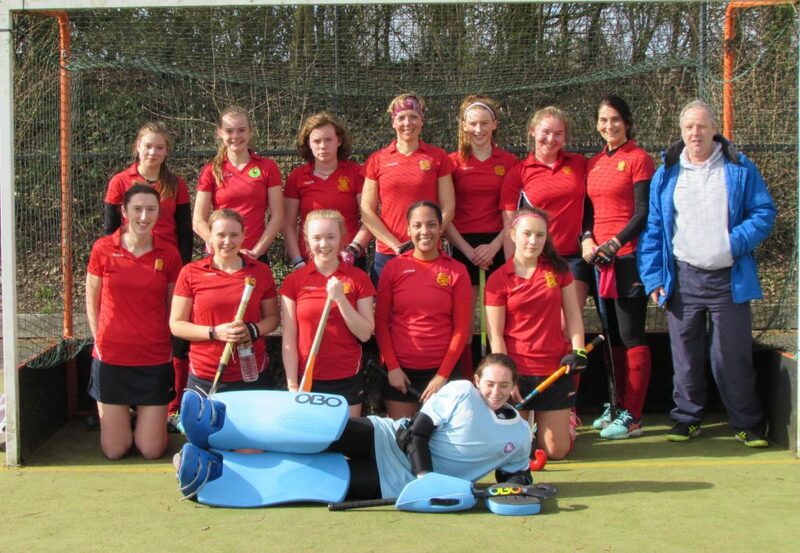 Whitchurch Ladies 1s entertained Wilmslow 3s at home for their last home game of the season. With Wilmslow still in contention for a top four finish Whitchurch were prepared for a tough game. From the whistle Whitchurch had majority of the ball putting plenty of pressure on the Wilmslow defence. Ellie Windsor started the goals rolling deflecting a shot from Lisa Sullivan. As the ball was passed around Wilmslow, there were more shots on goal from Hebe Dixon and Helena Dannenfeldt, but Wilmslow defence held tight. Ellie Windsor’s picked the ball up on the edge of the dee beating the last defender and fired an unstoppable shot into the bottom corner for her second of the game. Every break from Wilmslow was tidied up by Millie Edwards and Catherine Reece-Gresty in defence, playing the ball wide to Sophie Ward and Helen Mellor who made some great runs up the wings. Whitchurch were relentless in their pressure on the Wilmslow defence rolling players to keep fresh legs and the intensity on their dee. Jessica Carruthers and Stephanie Stanton worked tirelessly up from and managed to place the ball for Captain Catherine Winter-Gresty to slot home a deflection from the keeper. Spirits were high and Whitchurch kept attacking; only minutes passed and Winter-Gresty collected the ball in the 25, drove into the dee and struck the ball into the far corner. Whitchurch just had time for another goal before half time as Izzy Huxley arrived on the back post to slot the ball under the advancing keeper. At half time Wilmslow obviously had a hard talking to as they came out a lot stronger and focussed, passing more around Whitchurch. Winning a run of short corners goalkeeper Maddie Sugden made a string of amazing saves, but Wilmslow eventually pressure was rewarded as they managed to score their first goal from a well practiced routine. Whitchurch continued with their game plan and again were back scoring as Stanton latched onto a cross and slipped the ball through the keeper’s legs. With five minutes to go and both teams getting tired the game slowed, but another short corner came for Wilmslow which they managed to score from. Player’s player was awarded to Millie Edwards. Whitchurch play their final game of the season away against Chester next week. With the season drawing to a close, Whitchurch were looking to ensure league safety as well as get a victory against a Chester team they drew within the previous fixture. It was to be another game-of-two-halves with the first half being made far more difficult by Whitchurch’s own efforts: again composure on the ball and movement off it were not what they could or should have been, and they struggled to find any fluency. Passes were easily intercepted; balls forward didn’t find their targets and poor first touches would leave people compromised. Tempers frayed on both sides, and a number of green and yellow cards were shown, which had been the case in the first fixture and was what both teams needed to avoid. What the Reds did do was grind out a goal, with Tom Forster passing a sideline ball to Nick Cooper who slipped it across to Ben Kimberley who put it into the top right corner. At the back, Whitchurch managed to keep every one of the many short corners out, but it was attritional hockey. It wasn’t helped by James Partington taking an accidentally-raised ball to the jaw and needing treatment, but one thing Whitchurch is much better at this season is using substitutes well, and the team restructured smoothly. The half-time talk was a stern one from captain Alex Fry, pulling no punches about what needed doing; the standards to which the team ought to hold themselves demanded an improvement in the second half, and anything less would not be acceptable. It is a pattern from this season that it is often the half time talk that marks a game’s turnaround, and it was the same this week: the second half was good in every way that the first half had been poor. Movement was better; control was sharper and marking tighter – often leaving the Chester defence no-one to pass at sixteen’s. The back row of Airan Jones, Dale Seymour, Fred Egerton, Forster and Partington improved the marking to cut out most attacks before they developed. Marcus Conway, Fry and Jack Barnes in the middle took control of the pitch, breaking the attacking circles at free hits and driving the ball up the pitch and, critically, their forward passes were now finding their targets. Up front, Sam Conway, Pip Jones, Craig Hockenhull, Kimberley and Cooper were causing the Chester defence endless problems with number of shots just wide or saved by the excellent keeper, including a shot by Airan Jones that almost crept between his pads. The pressure finally told, with a drive down the right by Sam Conway getting passed to Forster who put a high ball across the face of goal where Cooper perfected an overhead smash to bury it in the net. It was not all one-way traffic in the second half, with Chester rallying well and Paul “Sturge” Leigh was instrumental in keeping the score line in check, including blocking and then clearing an attack despite it being three-on-one as the defence were beaten and struggling to get back. Sturge was again the saviour as a drive into the dee by Chester ended with a flick to the right of the goal but an outstretched toe was enough to divert it past the post. Chester did manage to get on the scoreboard with a speculative ball forward being only partly blocked by Partington – directly into the feet of Seymour, and the Chester forward didn’t wait for a whistle for the short corner but pulled off a skilful flick over a diving keeper. Whitchurch regrouped, determined not to let the game get away from them, and were able to win a short corner at the other end. The routine went well, with the ball being moved around the dee before Barnes drilled a shot through a group of players for Whitchurch’s third. At the end of the game, the result was what Whitchurch needed, even if the first half wasn’t one to remember. Chester were decent opposition and made the Reds work for their win, but the way Whitchurch came back for the second half and the application they showed was much appreciated by both the team and the supporters. 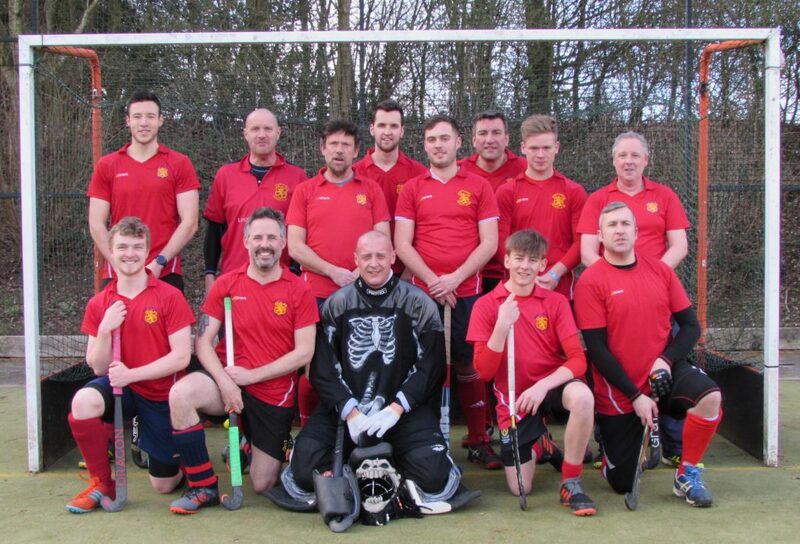 They have their last away game for the season against Oxton Men’s 4s next week. After putting out an under-strength side last time out, the Reds welcomed back a number of key players for their visit to table-topping Chester. The reverse fixture saw Chester run out comfortable 6-0 winners, so Whitchurch were looking to improve on that outcome, building on their much improved performances in the second half of the season. As expected, an experienced Chester side took the game to Whitchurch from the off, putting pressure on the Whitchurch dee but not managing to penetrate the youthful defensive line of Will Snaith, Wyn Morris, Brendan Coburn and Alex Leigh. The Whitchurch midfield also played their part, breaking up the home side’s momentum and ensuring the Chester attack had only scraps too feed off. On the odd occasion they did break through, Gareth Teggin in goal assuredly cleared any danger. As the first half wore on, the young Whitchurch attack of Luke Beddow, Euan Morris and Ethan Gresty began to make inroads into Chester’s back line, creating a number of half chances that unfortunately lacked a finishing touch. Chester became more reliant on route one hockey, bypassing their skilful midfield players with long hits towards the Whitchurch dee. One of these hits found a Chester attacker, and from the resulting melee the ball somehow squirmed its way over the line to give the home side the lead. Buoyed by the goal, Chester continued to press, forcing a good stop from Reds keeper Gareth Teggin, but the pressure eventually led to a controversial penalty flick awarded to the home side. While the ball undoubtedly struck a Whitchurch foot on the goal line, the frantic scramble beforehand saw at least two players lose their footing in the dee competing for the ball, with the ball striking the head of a prone Chester player before falling nicely for the Chester shot on goal. Whitchurch continued to play their attractive passing hockey, and a superb move featuring Richard Leigh, Joe Coburn and Euan Morris found Luke Beddow in an excellent shooting position in the Chester dee, only for the umpire frustratingly to blow for a short corner before Luke could get the shot away. The resulting short came to nothing, but the Reds passing and movement, with replacements Owen Pearce and James Page playing their parts, increasingly worried the Chester defence, and they were perhaps the more relieved of the two sides to hear the half-time whistle. The second half got off to a more even start, with neither side able to gain the upper hand. The pattern of the latter stages of the first half began to play out once again, as Chester fell back on big hits towards the Whitchurch dee, while the Whitchurch youngsters looked to pass and move the ball up the field. Chester left two attackers high up near the Whitchurch dee, but one fluffed opportunity aside, the Whitchurch defence coped well with the tactic, with Mark Sugden bringing his experience to bear with some good interceptions and accurate passing out of the danger area. As the second half progressed, Chester legs began to tire and the game was played more and more in the Chester half. However, despite some attractive build-up play, Whitchurch were unable to make meaningful inroads into the Chester dee, foiled by a combination of a packed defence and a reticence to actually fire the ball into the dee; there was also at times a lack of composure on the ball. David Brunyard, Joe Coburn and Joe Faithfull worked tirelessly in midfield to push the Reds on, but in the end, neither side was able to make the opposing goalkeeper work for large parts of the second half. Despite Whitchurch seeing more of the ball, the lack of a cutting edge meant that the game ended without further addition to the score line. The Chester players were gracious in victory, acknowledging that the very promising crop of Whitchurch youngsters had played the better hockey for most of the game. On this occasion, route one hockey had ground out a win for the home side, but the passing, movement and teamwork shown by the Reds once again illustrated how far the team has come since their defeat against the same Chester side earlier in the season. The result in no way reflected the game, Whitchurch started the first half taking the game to Sale who looked shell shocked at the attacking prowess of the Whitchurch team. Whitchurch created chance after chance in the first 15 minutes and eventually took the lead as Nicola Forster swept the ball up into the roof of the net. Whitchurch then undid all their good work as two mistakes in defence gave Sale two chances in five minutes and Sale clinically took their opportunities. The Whitchurch heads dropped as the team focussed on the negative and not on the positives of the first 15 minutes. Sale ruthlessly exploited the nervousness in the Whitchurch side and two more chances resulted in two more goals before the break. The half time talk focussed on playing like the first 15 minutes and not worrying about mistakes. Whitchurch took this on board and started the second half as they did the first taking the ball to the Sale defence with a confidence that has only been seen in limited periods this season. Phoebe Jones, Molly Fry and Emily Vernon tackled and passed the ball around the midfield creating opportunities for Tracy Tolhurst, Caitlin Edwards and Beth Wright to get the ball into advanced positions. The defence of Chloe Lloyd, Captain Emma Clarke, Becky Brookfield and Marta Teggin broke down the Sale attack and moved the ball swiftly up the field starting the Whitchurch counter attacks. As the legs started to tire Whitchurch used their subs and Ellie McEvoy came on in the midfield and with tireless runs linked up with Nicola Forster in the Sale dee. Whitchurch created many chances and had much of the possession but just couldn’t manage to get the ball in the back of the net despite creating the opportunities. Sale were content to sit back and counterattack on the break forcing sweeper keeper Gwyn Thomas-Rees to accelerate off her line to clear the ball on a number of occasions. Despite all their efforts Sale were again clinical in the dee and took their two opportunities of the second half. Whitchurch took many positives from the match having competed for long periods of the game and will work hard in training to achieve this level of play over a match and not just short periods. Whitchurch travel away to Macclesfield for their final league match of the season. Whitchurch travelled away to their penultimate game of the season against Alderley Edge. Whitchurch fielded a predominately young team on the pitch but the experience of Alderley Edge starting fast caught Whitchurch off guard scoring their first, closely followed by a short corner giving them a two goal lead. Holly Gilbert, Caitlin Shaw and Milly Carruthers put up a strong attack against the home team with some excellent interceptions and passes. Unfortunately, Alderley Edge managed to increase the score line and by half time they were ahead by six goals despite some excellent saves by Louise Cottrell in goal. The second half began with Whitchurch attacking strongly and having a couple of short corners awarded due to errors made by the home team. Unfortunately Whitchurch failed to capitalise on these chances. There was some strong tackling from Laura Workman and Sophie Jones on the left backed up by some excellent defensive play by Annie Leigh and Mel Reid who got player of the match. On the opposite side of the pitch there was some equally strong tackling and attacking from Mia Spruce, Emily Lister, Wendy Cooper and Jan Teggin. Unfortunately, despite Whitchurch’s fighting spirit to the end the home team took their chances well for an impressive win. Whitchurch entertain Neston ladies next week in their last match of the season.